Liverpool career stats for Kenny Dalglish - LFChistory - Stats galore for Liverpool FC! Kenneth Mathieson Dalglish was born in Dalmarnock in the east of Glasgow only a short distance from Celtic's Parkhead. But the family lived there only briefly and moved to an apartment house in Milton, which had a good view over the Rangers training ground. Dalglish’s supreme football talent was soon obvious in the YMCA boys team he played in. He was picked for the Scottish u-15 national team and played his first game against Northern Ireland and sealed the win with two goals. Dalglish was only 15 years old when he played his first game in a Liverpool shirt. He was given a week-long trial and played one game with the B-team against Southport in a 1-0 win on 20 August 1966. Despite Dalglish’s interest in joining his favourite team, Rangers, he accepted Celtic's offer in July 1967. Celtic had just become the first British team to win the European Cup and were widely known as the Lisbon Lions. Dalglish went on loan to Cumbernauld United that was one of the teams Celtic used to mould their players. Dalglish scored four goals in his first game and had scored 37 goals by the end of the season. Dalglish wanted to turn professional right away, but Stein wanted him to play another season with Cumbernauld. The kid held his ground and after asking his father to talk to Stein the boss caved in. Dalglish played his first senior game for Celtic on 25 September 1968 when he was a second-half substitute in a 4-2 win over Hamilton Academical in the quarter-finals of the cup. He played with the reserves for the whole of 1968/69 but only managed four goals in 17 games. He was moved into midfield the next season and his performances improved. Stein put him in the first team against Raith Rovers on 4 October 1969 and Dalglish was a bit nervous as he recollects: "Bobby Murdoch sat down next to me while I was getting ready. He asked me whether I was nervous. 'No', I said, 'I am all right, Bobby, thanks.' 'Well,' he replied, 'you are putting your boots on the wrong feet.' I looked down and it was true. I had been tugging my right boot on my left foot. I sorted myself out and we won 7-1." Despite seven goals Dalglish didn’t get on the scoresheet and neither in the next three games he started in. The reserves on the other hand benefited from his goalscoring talent from midfield as he helped them to the league and cup double. Celtic's reserve side at the time was dominant and known as the "Quality Street Gang", named after "the chocolates", Dalglish explained. He scored 19 goals in 31 games, not bad for a midfielder. Dalglish started the next season the same way his last ended and scored 23 goals when Celtic reserves crushed all of their opponents, scoring a total of 108 goals in 34 games. The highlight of his season came when the two Glasgow teams met in the reserve cup final. Dalglish scored one goal in the 4-1 win in the first leg but in the second leg he showed no mercy and scored a hat-trick in a 6-1 win. Stein couldn’t be anything but impressed and picked him for the first team in a beneficiary game against Kilmarnock. Celtic won 7-2 and Dalglish scored six goals. It was obvious the boy had turned into a man. Celtic continued their domestic dominance by winning their seventh consecutive league title as well as beating Hibernian 6-1 in the Scottish cup final. Dalglish scored 23 goals in 49 games and one of the major newspapers in Scotland voted Dalglish "Player of the Season". He played his first senior game for the national team on 10 November 1971 in a 1-0 win over Belgium in a European Championship qualifier. Celtic won the title again and Dalglish had his best-ever season at Celtic in terms of goalscoring as he scored no less 41 goals in 53 games! The 1973/74 season was the beginning of Celtic’s problems. The players' salaries were low and they were getting restless because they had some great offers from English teams. Despite the team being unsettled, Celtic won the title again and the Scottish cup. Celtic also reached the semi-finals of the European Cup, but lost to Atletico Madrid in an ill-tempered duel. Three Atletico players were sent off in the goalless first leg at Parkhead which Dalglish described as "without doubt the worst game I have ever played in as far as violence is concerned." Celtic lost 2-0 to Atletico in Madrid where ugly pre-game threats had tarnished the game. In the 1974/75 season Rangers ended Celtic's dominance in the league. Dalglish had been moved back to midfield orchestrating Celtic's play. Twenty-four-year-old Dalglish was made captain before the 1975/76 season, but the situation at Celtic got progressively worse when their manager, Jock Stein, got seriously injured in a car accident and had to rest throughout the season. The title was lost again, but Dalglish was voted the Player of the Year in Scotland by the Players' Association. Dalglish was becoming restless at Celtic but agreed to stay a bit longer, but the 1976/77 season was to be his last with Celtic. Jock Stein came back and Celtic retrieved the title and won the cup. 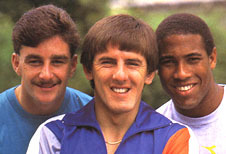 Dalglish’s teammates weren’t surprised that he wanted to test pastures new. He had been the driving force of the team for the last three years and if he wanted to evolve as a player he had to leave. In his Celtic career Dalglish played 322 games and scored 167 goals. He won four League titles, four Scottish Cups, a League Cup and earned 47 Scotland caps. On 13 August 1977, Dalglish played his first game for the Reds against Manchester United in the Charity Shield which finished in a goalless draw. The Liverpool fans were excited, but kept in mind that many good players had come from Scotland but hadn’t succeeded south of the border where the League is tougher. Dalglish’s teammates were not bad: Ray Clemence was the 'keeper, Phil Neal and Joey Jones full-backs, Phil Thompson and Emlyn Hughes central defenders, in front of them Ian Callaghan and Terry McDermott, Ray Kennedy and Steve Heighway on the wings and up front David Johnson and David Fairclough. Promising defender Alan Hansen waited for his chance in the first team. Dalglish’s League debut was away to Middlesbrough which included a young Scot named Souness. The Liverpool Echo described the action: "The first goal of the game came appropriately enough from the £440,000 feet of Kenny Dalglish, what a start for Liverpool's record buy. It stemmed from a lovely down the middle move as Case controlled the ball just inside the Boro half, flicked it through to McDermott who turned into the path of Dalglish. Boro looked for an offside decision which wasn't there and Dalglish strode smoothly on to beat Platt comfortably as the goalkeeper came out. It was a perfectly finished shot to a fine move and the Liverpool players enveloped Dalglish in their congratulations for his opener." Dalglish scored in his first four games and seven wins from 11 in the League meant Liverpool were second after 12 rounds, two points behind Nottingham Forest. Liverpool lost three League games in a row and their inconsistency killed any hope of winning the title. Paisley had strengthened in January by buying Souness who fitted seamlessly into the team and while the Reds were not in ideal form domestically they were clearly determined to defend their European title. The European Cup final was a fairy tale ending for Kenny's debut season. Halfway through the second half Souness' brilliant through-ball let in Dalglish who chipped the ball expertly into the net past the advancing Danish 'keeper, Birger Jensen. Dalglish could be pleased with his first season at Anfield: 31 goals in 62 matches, League and League Cup runner-up and a European champion. Liverpool started the 1978/79 season by scoring 35 goals and conceding only four in ten wins out of eleven League games. Dalglish had scored ten including a brace when Liverpool beat Tottenham 7-0 at Anfield which is still today considered one of the greatest games in the club's history. But, only two weeks later they lost 2-0 to the English champions, Nottingham Forest, in the first round of the European Cup followed by a goalless draw in the second leg at Anfield. An early exit for the double European champions. This shock didn't knock Liverpool out of their stride and from Christmas they only lost two games for the rest of the campaign; against Manchester United in a FA Cup semi-final replay and Aston Villa in the League. Dalglish wore the captain's armband briefly during the season as Emlyn Hughes was no longer a regular. The Scot, however, didn't feel comfortable as captain and Paisley appointed Phil Thompson in his place. Liverpool gained a record total of 68 points (two points for a win) and only conceded 16 goals, which was also a League record. Liverpool won the title with eight more points than the runners-up, Nottingham Forest. Dalglish scored 21 League goals and combined well with David Johnson, who scored 16 League goals. Once more Bob Paisley's judgement of players hadn't failed him. Dalglish scored 56 goals in 116 games in his first two seasons at Liverpool and his contribution had won over the media that voted him Player of the Year in 1979. Liverpool dropped out of the European Cup in the first round as the season before, this time against Dinamo Tbilisi. Until then Liverpool had failed to gain any momentum, but remained unbeaten from 6 October until 19 January. Liverpool and United were neck and neck for the rest of the 1979/80 season until Liverpool clinched their second consecutive title with a 4-1 win at home to Aston Villa in the penultimate game of the season. Liverpool only managed fifth in 1980/81, their worst placing for ten years. Johnson and Dalglish weren't producing goals. Remarkably Dalglish had played 180 games in a row since joining Liverpool in August 1977 until he was out injured against Bradford City in the League Cup on 27 August 1980. Dalglish went 16 games without a League goal from late November to the end of the season. Liverpool did on the other hand reach the finals in the League Cup and the European Cup. Dalglish netted the first of two in the replayed League Cup final against West Ham. He started the European Cup final against Real Madrid even though he had been out injured since the second leg of the semi-final against Bayern in Munich. Alan Kennedy's goal secured another European Cup. Dalglish failed to score in the first nine League games of the 1981/82 season but finally ended an 11 months' draught in the League against Brighton on 17 October 1981. Dalglish ended up with 13 goals in 42 matches, being ever-present in the League for the fourth time in five seasons. His new strike-partner, Ian Rush, scored 17 goals in 32 League matches as Liverpool recaptured the Championship. Dalglish was the architect of Liverpool's League win in 1982/83. Rushie benefited from playing upfront with him since many of his goals came after a brilliant pass from the Scot. 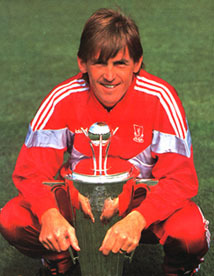 Dalglish was voted Player of the Year by both the press and players. Bob Paisley quit at the end of the 1982/83 season leaving Joe Fagan in charge. Dalglish reached a milestone in his Liverpool career on 26 November 1983 when he scored his hundredth League goal for the club with a fantastic shot into the top corner against Ipswich. 1984 didn't start too well for Dalglish when Kevin Moran broke his cheek-bone with the support brace on his wrist in a game against Manchester United on 2 January. Dalglish missed 14 games, but made his recovery in time for the quarter-finals of the European Cup against Benfica on 7 March. The last weekend in March proved to be a big one for Dalglish. The 33-year-old was pleasantly surprised to be offered a four-year contract and was included in the Team of the Year along with four of his teammates and played at Wembley. Liverpool and Everton drew 0-0 after extra-time in the League Cup final and won the replay. The enigmatic Scot was busy smashing European records. Dalglish surpassed Denis Law's scoring record when he scored his fifteenth goal in the European Cup against Odense Boldklub in the second leg of the first round. He had now played more games, 54 in total, and scored more goals in Europe's premier competition than any other British player. Dalglish played in his third European Cup final, this time against Roma at their own turf. The game went into a penalty shoot-out, but Dalglish had by then been substituted since he couldn’t quite cope with the heat in Italy and was carrying a slight injury. Alan Kennedy was the hero like three years previously and scored the decisive penalty. Dalglish had won his third consecutive League title, fourth consecutive League Cup and the European Cup for the third time in seven years. In 1984/85 Dalglish was dropped for the first time in his Liverpool career when Liverpool faced Tottenham in a live televised match on 12 October. Liverpool lost 1-0 and Fagan admitted it had been his most stupid decision as manager and put him straight back in the team. Dalglish missed more games after receiving a three-match ban for being sent off for the first time in his career against Benfica in Lisbon on 7 November. A week later he scored his thirtieth and final goal for Scotland in a game against Spain, equalling Denis Law's record. A great honour was bestowed upon him in the 1985 New Year Honours List when he was awarded an MBE for services to football. The week before the European final against Juventus at the Heysel stadium Kenny received a phone call from Peter Robinson, Liverpool's Chief Executive, who asked if he and John Smith could pay him a visit. 'Yes, no problem,' was Dalglish’s reply. Dalglish describes the rest of the conversation in his autobiography: "I thought the conversation was going to finish then but Peter added: 'Don't you want to know what we want to see you for?' 'Yes,' I replied, 'if you want to tell me.' 'Well, we'd like to offer you the manager's job.' 'That's no problem, Peter, you can still come to the house.'" Dalglish accepted the offer on the condition that Bob Paisley would be by his side for the first two years. Liverpool returned to England in the middle of a media frenzy after 39 people died at the Heysel stadium. Liverpool held a press conference later that day presenting Dalglish as the new boss. He couldn't have imagined worse circumstances as Liverpool were on their way out of Europe for the unforeseeable future. Smith told the gathering: "Kenny is entering the managerial side for the first time and we have every reason to believe he will have a successful period in office. We feel we have a man of great ability on the field who has got an old head on young shoulders." Once the press conference was over Dalglish found Ronnie Moran and Roy Evans in the Bootroom. "I said to Bugsy, 'You're staying aren't you?' Turning to Roy, I added, 'You're not going away?' Both shook their heads. 'You'll always have a job the two of you while I'm manager,'" said Dalglish as he ensured he had the backing of his trusted lieutenants. One of the most successful teams in Europe was banned from taking part in European competition for an undisclosed period and had lost the League title to neighbours Everton. Many questioned Liverpool's decision to make Dalglish the first player-manager in the English First Division. One of his closest friends, Souness, had said in an interview with Scottish journalist Gerry McNee the year before, that he had a feeling that the next manager of Liverpool would be Kenny Dalglish: "People are a bit frightened of him. He growls at them, he makes them jump." When Dalglish looked around the manager's office, his secretary, Sheila, who worked for all Liverpool managers from Paisley to Benítez, asked him if he wanted a new desk. Kenny describes the scene in his autobiography: "I looked around my new office and replied; 'This was Bob's desk, this was Joe's chair.' 'Why would I need new ones?' 'We are getting new office furniture.' 'Is it expensive?' 'Oh, yes,' Sheila replied, 'it's quite a few quid.' I said: 'Just put a bar in, Sheila.' So they installed a full-length bar, made of wood and formica." Dalglish took over a successful team in the 1985/86 season, but in the first part of the season he had to replace the victorious full-backs of the Paisley era, Neal and Kennedy, with Steve Nicol and Jim Beglin. Dalglish made Jan Mølby his playmaker and signed midfield enforcer Steve McMahon from Aston Villa for £350,000 in September. Dalglish gave Craig Johnston and Paul Walsh a chance in his position. At the end of November Liverpool had reduced Manchester United's lead from nine to two points. Liverpool slipped up and when Dalglish the manager needed an inspiration for his side Dalglish the player came in handy! The 35-year-old's presence in team transformed Liverpool's form. Six wins in a row in the League set up a thrilling finish. In the final round at Stamford Bridge Dalglish controlled the ball on his chest and a moment later he wheeled away in celebration, just having secured the Championship with his brilliant goal. Seven days later Liverpool faced Everton at Wembley in the FA Cup final, going into half-time 1-0 down. Dalglish's troops secured the club's first League and Cup double by scoring three in the second half. Manager of the Year King Kenny really had the golden touch. Dalglish knew it would be difficult to repeat this feat and by the turn of the year Liverpool trailed first-place Arsenal by nine points, in third. Liverpool took 1987 by storm and won nine of the first 11 League games and had by mid-March gained a few points' lead on Everton with Arsenal falling by the wayside. The Reds lost three League games in a row as well as the League Cup final to Arsenal. In the end Everton won the League Championship with a comfortable nine-point margin. Key changes were made to the team as Rush departed with Aldridge replacing him in the middle benefiting from the service of John Barnes on the left and Peter Beardsley's link-up play. Kenny was developing his own team with a different identity than the ones governed by his predecessors. Paisley was no longer by his side and retired to the boardroom. Barnes was the new talisman making Liverpool a more potent attacking force. The Reds started the season with three away games as a collapsed sewer under the Kop needed repair. Liverpool ripped Coventry City apart following an opening day 2-1 win over Arsenal. Liverpool were on a rampage netting four goals in four consecutive League games; against Newcastle, Derby, Portsmouth and Queens Park Rangers. Aldridge thrived up front, having scored in ten League games in a row, still a Liverpool record. The Reds' fear factor was overwhelming opponents, even QPR who led the First Division by three points, having played two more games than the Reds, before their clash at Anfield on 17 October. QPR lost 4-0 to an astonishing double from Barnes. One interested spectator at his old turf was Ian Rush. "They are a better team than when I left them behind," Rushie said. "Barnes has so much skill and he livens up the game. He scored two great goals and took the limelight away from Beardsley, who works so hard and makes openings for other people. With wingers, Liverpool have given themselves even more options and their opponents just don't know where to look." From 19 December 1987 to 16 March 1988 Liverpool conceded one goal and scored 31 in 15 games in all competitions! Everton prevented Liverpool from improving Leeds' record from 1974 of 29 League games unbeaten when Wayne Clarke netted the only goal of the game at Goodison on 20 March. Nottingham Forest inflicted a second League defeat on Liverpool on 2 April in the first game in a series of three between the sides in a space of 11 days. Liverpool beat Forest 2-1 in the FA Cup semi-final and then annihilated Brian Clough's men at Anfield 5-0 in a showcase of all the talent on offer at Liverpool that Sir Tom Finney claimed "was the finest exhibition I've seen the whole time I've played and watched the game." Nine points separated Liverpool and second-placed Manchester United at the end of this dazzling campaign. The only blot on the landscape was a surprising 1-0 defeat to Wimbledon in the FA Cup final which prevented a second double in just two years. Dalglish had got it right when signing players during the summer. Aldridge scored 29 goals in 45 games, Beardsley scored 18 in 48 games and John Barnes scored 17 in 48 and was voted the Player of the Year by both the media and the players. It didn’t come as a surprise that Dalglish was voted the Manager of the Year. Liverpool won the title in style and the way they played reflected their manager. This team played a more offensive football than the previous teams and was more about individual play of great players even though the team spirit was high. This was Kenny Dalglish’s team. On 18 August, two days before Liverpool played Wimbledon in the Charity Shield, the press was stunned; Kenny Dalglish had just announced that Ian Rush had returned to Liverpool. The excitement before the season was great and the fans wondered how he was going to use Barnes, Beardsley, Aldridge and Rush in the same side. On 26 October Liverpool suffered their third defeat of the season, one more than all of the season before. After ten League rounds Liverpool were fourth, eight points behind Norwich. Aldridge had only scored seven goals compared to 20 the year before, Barnes six, Rush five and Beardsley four. Following a 3-1 defeat to Manchester United on New Years' Day Dalglish locked his side inside the dressing room and what followed was a verbal attack of a calibre that none of his players had seen before. Dalglish's outburst worked like a charm as his team went undefeated in the next 18 League matches, of which 15 were won. In the semi-finals of the FA Cup against Nottingham Forest football got a whole new meaning for Kenny Dalglish. This was the third time Dalglish had witnessed a tragedy in a football stadium. When he was in the Celtic squad at the age of nineteen, 66 died at Ibrox, 39 died at Heysel and 96 Liverpool supporters died from injuries received at Hillsborough. The press and the supporters saw a new side to Dalglish as he united the club and city in their grief. The harrowing scenes Dalglish witnessed at Hillsborough and in its aftermath and the care he showed to the victims' families without seeking help to deal with the mental anguish he was experiencing came back to haunt him. Liverpool were rushed to action by the Football Association for the replay. Symbolically the Reds faced the Blues in the final on an emotional day. Kenny's old mate, Rush, proved to be worth his weight in gold, ensuring a 3-2 win. The last League game was between the two top teams at Anfield. Liverpool had 76 points but Arsenal 73. The goal difference for Liverpool was 65-26 (+39) but Arsenal's 71-36 (+35). A two-goal win in favour of Arsenal would win them the League Championship. In the final minute Michael Thomas scored Arsenal's second that grabbed the title away from the hosts. Liverpool had been 45 seconds away from a second double! Come mid-October 1989 Liverpool had only lost one game for the past seven months, which was, crucially, the title decider in May. Crystal Palace had been beaten 9-0 as Liverpool broke the record for the most goals scored by one team in a match in the top league. Liverpool's form proved to be far less convincing for the rest of the season. Liverpool had a one-point lead when the Israeli Ronny Rosenthal came on loan from Standard Liege in Belgium. He scored seven goals in eight games and the Reds won their eighteenth League title and Dalglish was Manager of the Year for the third time in five years. He hadn’t picked himself for the team on a regular basis since October 1986 and made his last-ever appearance when he came on against Derby in the penultimate game of the season. One of the greatest players in the history of football had retired after playing a total of 837 games and as the most successful player in the history of the British Isles. Bill Shankly and Bob Paisley both consider King Kenny to be the best player who has ever worn the Liverpool shirt. Paisley said: "Of all the players I have played alongside, managed and coached in more than forty years at Anfield, he is the most talented. When Kenny shines, the whole team is illuminated." From Harry Redknapp's latest book, A Man Walks On To a Pitch. PUBLISHED: 22:00 GMT, 9 October 2014 on the Daily Mail. The Guardian on 6 February 2004. From The Times by Gabriele Marcotti and Guillem Balague. Match report from The Press Association on Liverpool - Blackburn on 14.05.1995. Match report from 03.05.1986 by Liverpool Echo. Match report from 17.08.1985 by Complete record. Match report from 24.08.1985 by Sunday Express. "Bobby Murdoch sat down next to me while I was getting ready. he asked me whether I was nervous. 'No', I said, 'I am all right, Bobby, Thanks.'. 'Well', he replied, 'you are putting your boots on the wrong feet.' I looked down and it was true. I had been tugging my right boot on my left foot. I sorted myself out and we won 7-1." "I soon saw Shanks again. Liverpool's first team were due to play West Ham the same weekend as my trial. As I walked through to the player's area at Upton Park, Shanks came along in the other direction. I was overwhelmed with embarrassment. I couldn't speak to him. I just kept my head down and hurried past. I heard his voice shouting 'Kenny' 'Kenny', but I said to myself, just keep walking, just keep walking. I regret not talking to Shanks, but I was only 15 and very shy. If anybody spoke to me, I'd blush." Kenny Dalglish went on trial at Liverpool and West Ham in August 1966. "Shanks said to me: 'I´ve got two pieces of advice for you - don't overeat in that hotel and don't lose your accent." Dalglish on the day he signed for Liverpool. "I was such a competitive player that I have punched defenders in my desire to win. It's not something I am proud to admit, but in the heat of matches it's easy to get carried away. My second worst moment of retaliation came in Europe against the Belgian defender Renquin. I couldn't believe he hadn't been dismissed. He had a tug at me, so I just swung my elbow, caught him right in the mouth. Two teeth came out and landed in the grass. I just kept running. Renquin was lying on the pitch. He got up and wasn't too pleased. There was a gap in his teeth. Elbowing him hurt me as well. My arm swelled up and there were two holes where his teeth had been, the impact had punctured my skin." Of course the big interest for Liverpool fans centred around the debut of £440,000 Kenny Dalglish, the Scottish striker who has the daunting task of trying to replace Kevin Keegan in the Kop's affection. Dalglish certainly showed every sign of doing just that. The United fans started by chanting "What a waste of money" but long before the end of the first-half it was the Liverpool fans who were replying chanting his name in delight as he showed a series of sparkling touches. Kenny Dalglish receives his MBE in March 1985 - From Shoot! The shrewdest move Paisley has ever made?